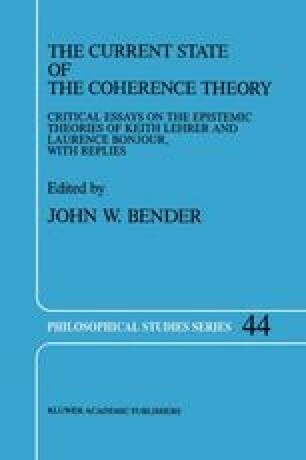 In two recent papers (1986 and 1988), Keith Lehrer has developed the coherence theory of knowledge and justification that he originally proposed in Knowledge, In broad outline, Lehrer’s new view is that one has knowledge when “the right combination of internal and external factors” are present, and this obtains when there “is a rational connection between subjective states and truth.” (1988, 330) Knowledge requires the proper “evaluation of incoming information in terms of background information.” (1988, 330) When a proposition coheres with one’s new information and one’s background information, it is justified. But this sort of justification is merely “personal justification”. One’s background information might be largely erroneous, so coherence with it (together with truth) is not sufficient for knowledge. What is required is also coherence with a system resulting from correcting the errors in the background system. When such coherence obtains, one has undefeated justification and, therefore, knowledge.